Got up to Grizzly Overlook by 7:30ish on the 15th after pitching a tent in Bridge Bay. The only entertainment that evening was a fox in the area. Still, enjoyed chatting with some familiar faces. Saturday, the 16th. Arrived at Grizzly Overlook 5:30am. The fog wasn’t bad, but got worse when the sun rose. After the fog cleared, there was a brief sighting of a black wolf way back by the far treeline. After he disappeared, there was some brief howling. At around 9:30 with nothing else visible, I headed to Canyon for breakfast and water filling. The mid-day goal was Avalanche Peak. As I left Canyon, there were jams all through the valley. While I was getting food, I guess the wolves were attempting a meal themselves. 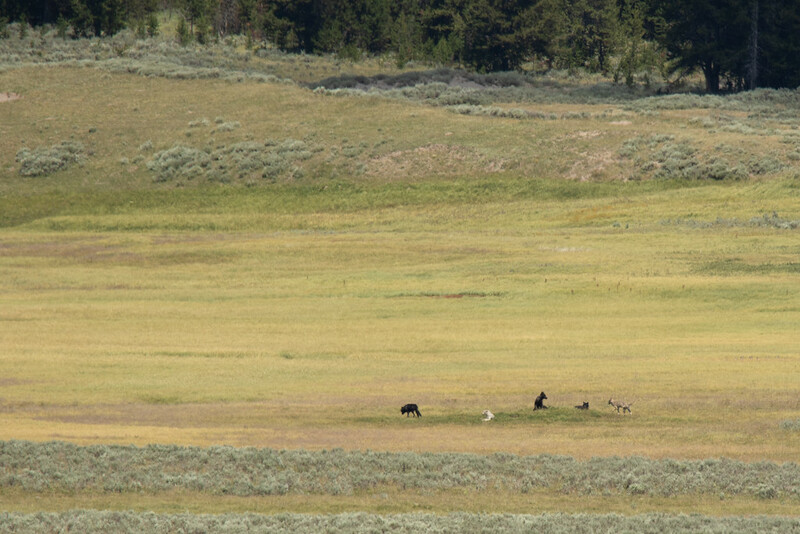 They were chasing elk, but were bedded down in a meadow by the time I arrived. Oh well. They were visible now though, so no hike today. Instead I decided to wait them out. They were bedded down long enough for me to suspect that they snuck away somehow. 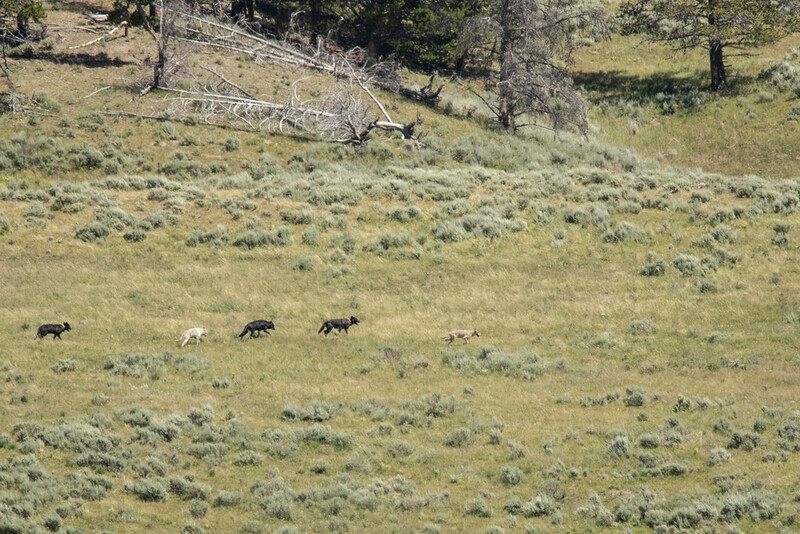 But in time, they eventually stirred, and we quickly had a view of all five – Wapiti alpha female, Wapiti yearling female, and three Mollies (I presume at least two of them are young males). Eventually they started heading south on some sort of mission. I lost them near Trout Creek. 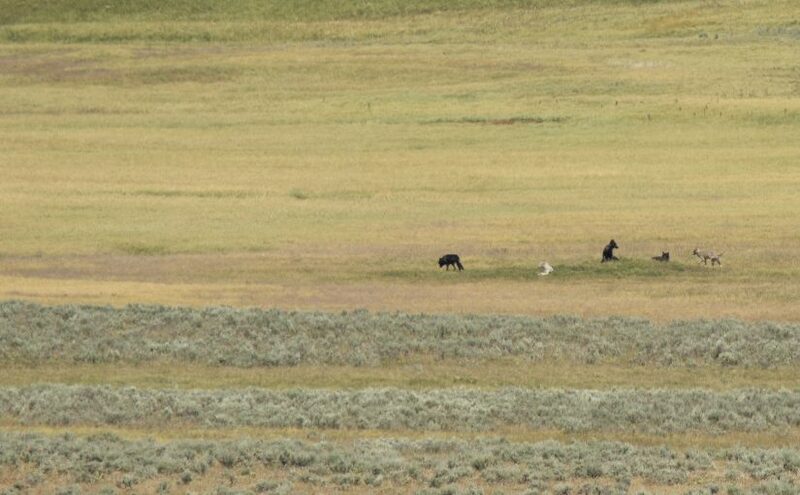 I think they went back into the trees that that point because they flushed out a huge herd of elk. I didn’t see any wolves, but I heard that the Wapiti females were attempting to take one. Mollies were not present. I hung around for a little bit but nothing else happened. 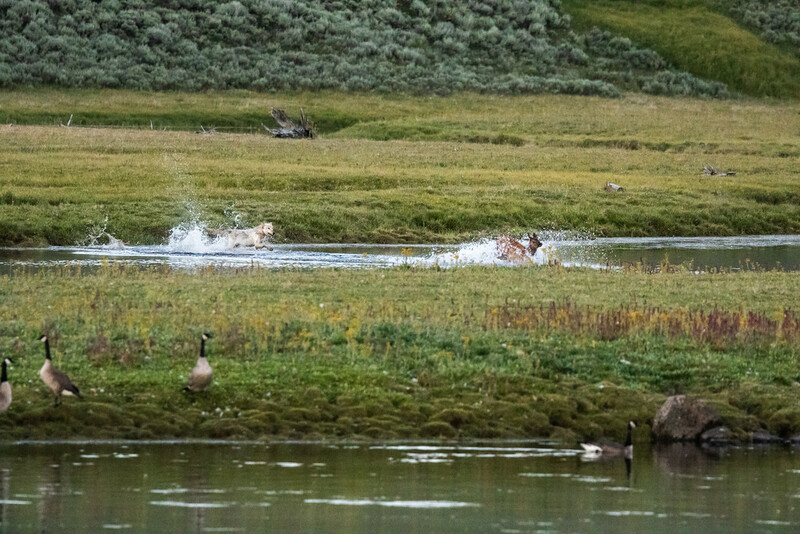 During the late afternoon, the Wapiti alpha female moved quickly from Trout Creek back to the rendezvous site with supposedly a full belly. I hope it was to feed the pups. Back to Grizzly Overlook for the evening. There was the fox and a bison to keep us company. At around 7:30, the Wapiti alpha female came out by the far treeline, heading south again. Lots of traveling for this one today! She walked in front of the overlook heading south, so it was time to hop turnouts back to Trout Creek. I have some pictures of her along the way, she was tongue-hanging-out-the-side tired and she trotted along. We lost her at the hilltop on Trout Creek again, similar as before. Some people saw her with a chunk of meat. A couple people saw her heading into the trees down at river level. Out vantage point was way too high to see into the trees, so I walked around trying to get a better view. First I walked up to Elk Antler Creek, followed that towards the river looking back to the tree spot – nada. Next I tried the other angle from Trout Creek, walking that to almost the river – bingo. The elk knew what it was doing, crossing the river three times in a row, putting more distance from the wolf each time. The wolf kept at it though, sprinting faster than I’ve seen a wolf go ever. It started to get the point of desperation though as the distance consistently grew larger. Where are her new pack mates? The last we’d seen them, they were close by. It seems that she is not counting on them for help. 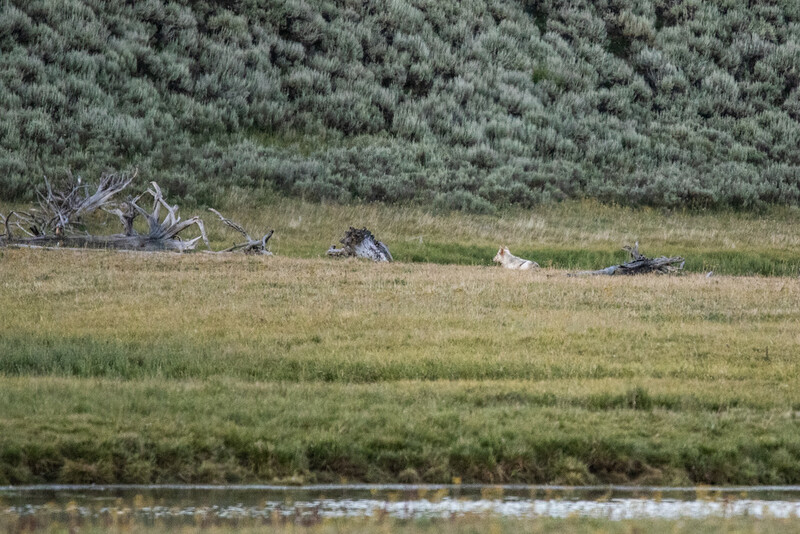 So the elk gets away, and the Wapiti alpha slowly makes it back to another stash of meat (or maybe an older kill) and starts munching. Guess who shows up? The three Mollies looking for a bite. By this time the light is almost completely gone.